The Polar Code is a convention endorsed by the International Maritime Organization (IMO) which is binding to all countries and which stipulates stricter safety and environmental protection regulations for freight and passenger vessels operating in the Arctic and Antarctic regions. The safety and environmental criteria of the Polar Code will come into effect on 1 January 2017, and the crew qualification and training requirements related to the Code probably on 1 July 2018. The Centre for Maritime Studies at the University of Turku’s Brahea Centre and the Energy and Environmental Engineering Research Unit at the Faculty of Technology of the University of Oulu have studied the aspects involved in the implementation of the Polar Code. The Polar Code has significant impact from Finland’s perspective. The implementation of the Code will increase the demand for specialised know-how and technology related to winter seafaring and operating in a cold climate. Finland can offer a breadth of expertise in, for example, the design and building of ice-class vessels and ice-breakers, as well as in environmental measuring technology and oil spillage response in ice-covered waters. Therefore, the Arctic Competence Centre currently being planned in Finland has several opportunities and a significant role in the commercialisation, export and promotion of Finnish expertise. From the perspective of the environment in the polar regions, restrictions governing in particular ballast water policy and climate change-inducing greenhouse gas emissions would be significant. However, the Polar Code does not, in its current form, impose any restrictions on such emissions. The ratification and implementation of the International Convention for the Control and Management of Ships’ Ballast Water and Sediments may have a positive impact on the Finnish maritime technology and cleantech industry, when the markets for new processing systems for ballast waters expand. Short-lived black carbon emissions reductions would bring substantial climate and health benefits. The development of prevention methods requires the development of standardised black-carbon measurement methodology to help establish more accurate emission reduction needs. The development and improvement of NOx, SOx and CO2 emission technologies and their adaptation to be suitable for black-carbon emissions would bring competitive advantage. Finland’s role is to support the IMO in this task. It is crucial for Finland to actively contribute to the further development of the Polar Code and other international conventions regulating seafaring. Finland holds the Chairmanship of the Arctic Council for the period 2017–2019, when we have the vantage point to promote the goals of sustainable exploitation of the polar regions, reductions in maritime emissions, international cooperation and the export of Finnish expertise. 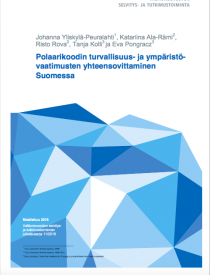 The final report of the project entitled Matching Safety and Environmental Regulations regarding the International Maritime Organization’s Polar Code in Finland (POLARCODE) was published on 24 March 2016 in the Publications of the Government’s analysis, assessment and research activities. The project was carried out as part of the implementation of the Government Plan for Analysis, Assessment and Research for 2015.